If you’re into powerlifting or you do heavy squats, deadlifts etc, then knee straps are a must. If your knees hurt when you squat or deadlift then it would be very wise to invest in a pair of knee straps today. 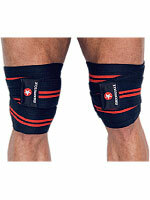 Knee straps protect your knees, joints and ligaments. You will find you can lift heavier without the danger of injuries. These knee straps are of excellent quality made with heavy duty Elasticon™ and come with a unique Velcro section to hold them in place during the most strenuous lifts. Washable.